Foul Bachelor Frog is one of the more easily understood and recognized memes, as his sayings commonly reflect the disgusting shortcuts and rather questionable personal habits of the male bachelor species. This meme is a variation of Advice Dog that originally surfaced late in June of 2009. It became so popular, that it became the number two copied image on memegenerator.net (Socially awkward Penguin holds the title slot). Foul Bachelor Frog remains one of the small group of memes that continues to be popular on 4chan. There exist spinoffs of the Frog including Foul Bachelorette Frog, who was possibly invented when Foul Bachelor Frog got bored one day. 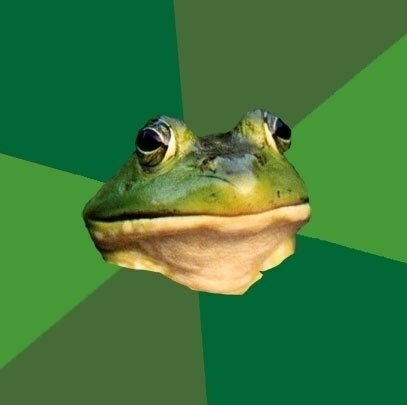 As with other memes, the meme consists of a photo of a frog centered on a multi-green colored background with his pearls of wisdom written in text around him. The photograph of the frog used seems to have captured a rather satisfied, slimy looking specimen of former tadpole. Notable quotes from Foul Bachelor Frog include “Armpits smell like Wolf brand chili – Me gusta”, as well as “Microwave food too long – put it in freezer”. Many people, not just bachelors, can relate to the slovenly antics of Foul Bachelor Frog. People have either been there previously, or know one or more people who exhibit those qualities. Thought we forgot your birthday on Friday?